We had a good day today, got up early and Robin started preparing for the feast. I grabbed the propane tank and we headed out to get that filled, then stopped by my parents to grab an ice chest. My sis was there and we hung out for a few minutes before taking off again. We got home, Robin slaved away preparing everything while I just stayed out of the way. I did chop the brussels sprouts and cook them. The family arrived, we hung out and watched American pickers for a bit. 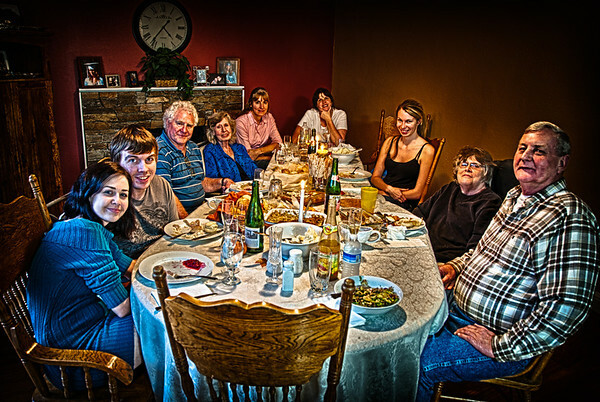 We waited until Brandon and Missa arrived before sitting down for the Thanksgiving meal. Pop lead us in prayer, thanking our Father in Heaven for all of His blessings and then we ate. And ate, and ate. I had grabbed a pre-dinner shot when the table was set all nice but Terri got cut out of the photo so we had a couple re-shoots. Jen and Corey called and we all passed the iPhone around so we could say "love you" to our family member who are in Texas. All-in-all, a great Thanksgiving! Everyone helped clean up while I snuck away to process my daily photo and post it. Just want to say "Hi, Love you!" to all my family, friends and loved ones. God bless you all. Well, gotta run, we still need to eat some pie!